Artistes: Jayant Savarkar, Satish Pulekar, Vijay kadam, Pradeep Kabre, Pramod Pawar, Jaywant Wadkar, Santosh Juvekar, Sayali Sanjeev, Nisha Parulekar, Satish Salagare, Swapnil Rajshekhar, Jaywant Patekar, Manasi Naik & others. Recently released film ‘Police Line Ek Poorna Satya’ is all about the lives of Mumbai Policemen and their family members. 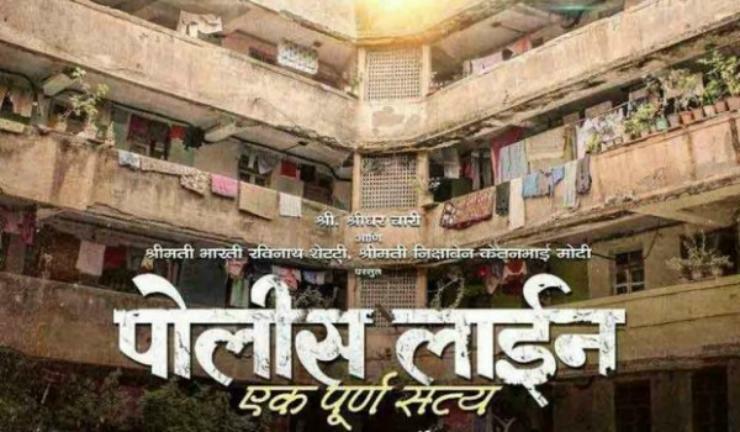 The film has highlighted the stressful condition in which they live in the city of Mumbai. It revolves around Balya Desai (Santosh Juvekar) who is the son of a retired Head constable (Satish Pulekar) and younger brother of Sunil Desai (Swapnil Rajshekhar) working as head constable with Mumbai Police. The film begins with Balya Desai, now a big Software professional, returning to Mumbai after 20 years, to work on an assignment. He is picked up from the Airport and is on his way to his destination, when he takes a halt at a Police Colony i.e. Police Line, to take him down the memory lane and the film moves into flashback, to show the past of Balya’s environment in which he spent his past years and the unfolding of events, including the 1992 riots of Mumbai and the role of duty bound policemen. Through the film, the makers have presented not only the problems faced by the Desai family, but have also shown the involvement of children of policemen in street fights, their happy times and bad times. There is also a love story between Balya and Divya (Sayali Sanjeev) from a well to do family. Overall, the film has invited the attention of administration and audience, towards the hardships faced by policemen and their family members. The issues related to late payment of their salaries, delayed payment of pensions & non availability of proper medical and loan facilities to them. Many veteran artistes from Marathi film industry, like Jayant Savarkar, Satish Pulekar, Vijay Kadam, Pradeep Kabre, Pramod Pawar & Jaywant Wadkar have impressed the audience through their respective roles. Swapnil Rajshekhar, who plays a corrupt policeman has very cleverly expressed the circumstances under which a policeman lives and the reason for becoming part of the corrupt system. Playing the role of his wife, Nisha Parulekar has portrayed an understanding wife, who later becomes helpless, after suspension of her husband. Santosh Juvekar, who plays the lead hero of this film, has played his role with total conviction, understanding different situations, faced by his character. Good support comes from other artistes. The background music of the film composed by Pravin Kunvar & Omkar adds to the perfectness of the film. Cinematographer Nilesh Dhamale has captured some action scenes well. Mahesh Manjrekar has narrated some shocking revelations during the film, about the poor facilities offered to Policemen in Maharashtra. Did you know that only 25% of policemen have been provided accommodation by the administration and last year 250 policemen committed suicide? All in all, director Raju Parsekar has skilfully presented the demands of policemen, through dramatic means.